Kitten Player is a lightweight audio player based on foobar2000 that offers a simple, practical but customizable interface. The main window provides essential playback controls and a progress slider, but also an area dedicated to playlist management. 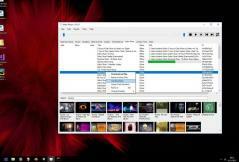 The application opens each playlist in a different tab, offering users the option to name the tabs. Nevertheless, you should be aware there is no function that would allow you to search a certain songs across all open playlists. Kitten Player has a very useful feature that allows you to load YouTube playlists and listen to them through the application.